This week I’m pleased to offer a series of guest posts by P. Andrew Och, a very talented journalist and photographer. Och and I have freelanced together numerous times. Enjoy his tales and insights from his recent trip to Grand Cayman Island. All articles and photos are by P. Andrew Och, unless otherwise noted. 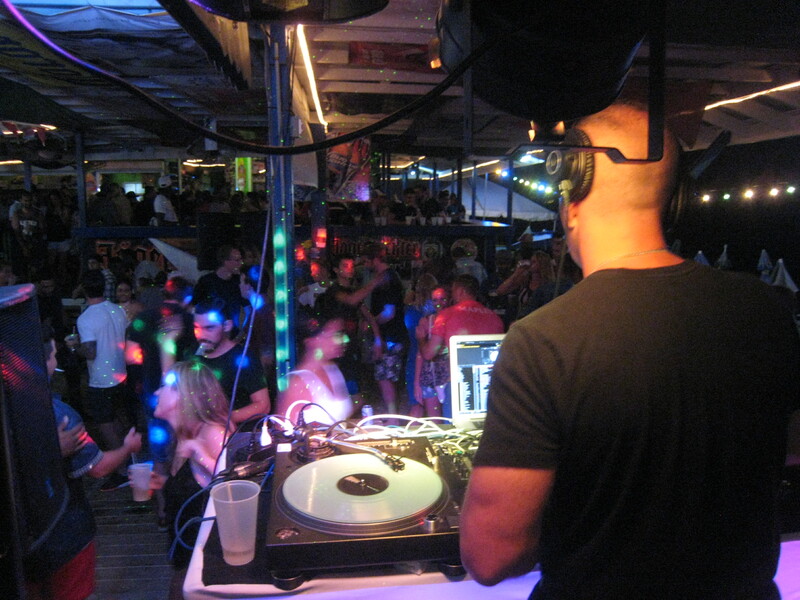 YOU CAN HIT THE TOP FIVE TIKI/BEACH BARS ON GRAND CAYMAN!!!! Named after the infamous pirate Jack Rackham, this open-air tiki bar has a beautiful view of the harbor. It’s a nicer dive bar that caters to tourists and cruise ship passengers by day, but gets taken over by locals and divers at night. A local chef told me that it’s the best diver dive bar on the island. 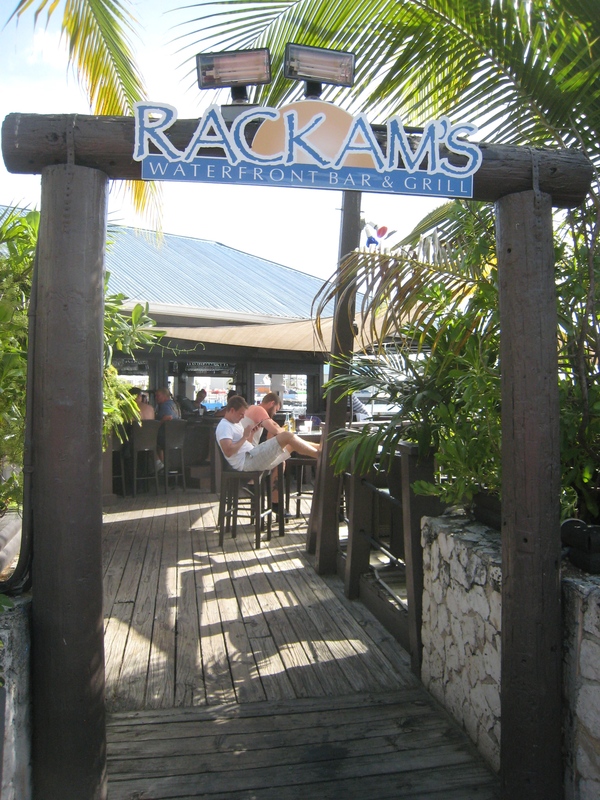 He said you can “get rowdy and not get thrown out.” So, if good food and better drinks are what you seek, wait for the cruise ships to set sail and set your sights on Rackham’s to get rowdy with the locals. Tiki Beach is exactly what you expect from an upscale beach bar. 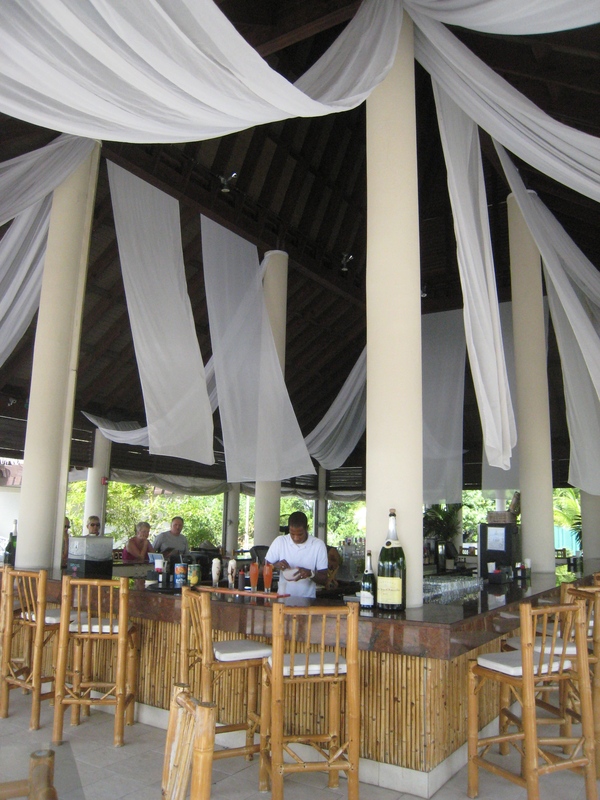 It has a big wood beamed, vaulted palm thatch roof, and flowing fabric accents that adorn the bar area and beach front lounges. This island paradise has fantastic frozen drinks and a fun lunch crowd. You know it’s a good scene when the local beauty salon’s aestheticians hang out there during afternoon breaks. Tiki Beach also has a beach with awesome snorkeling and easy access to water sports. Although similar in many ways to the other bars in town that get their cruise ship crowds, Royal Palms stands out with their pool bar. 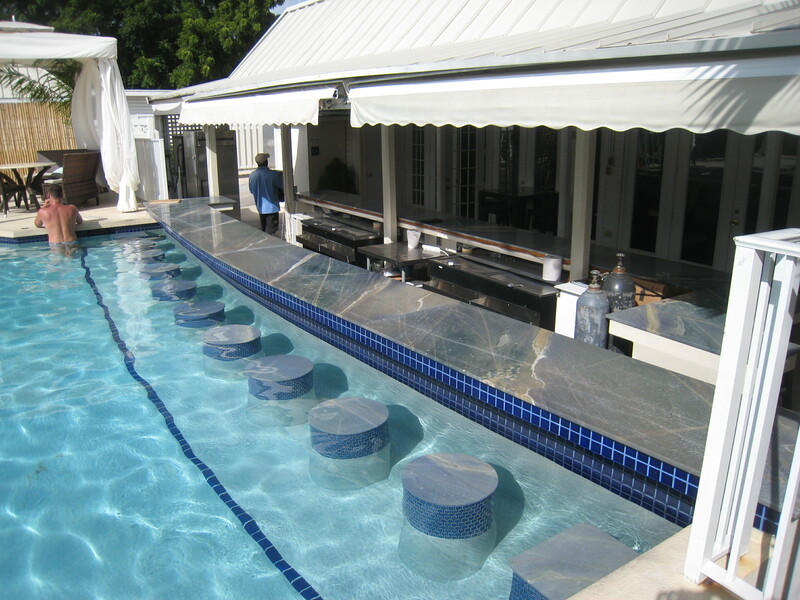 Keep your back warm in the sun and your bum cool in the pool, as your bartender serves up the umbrella drink of your choice. Here’s the big secret to Royal Palms… their Sunday brunch is amazing! No matter who I asked or what part of the island I was on “researching” this article (tough jobs are done by tough people) everyone said, “You’re going to Calico’s, right? !” And as luck would have it, I was there at just the right time for one of Calico Jacks’ famous full moon parties. Now, my trip was during the off-season and this joint was hopping. My new local friends told me this was NOTHING compared to the full-blown full moon parties of the high season that overflow onto the beach with DJs and lights up on scaffolds and the THUMP, THUMP, THUMP of the beat on the dance floor under the stars. This bar is for everyone who likes to drink, dance and have a great time. This is a tiki beach bar to end all tiki beach bars. At the pool, reserve your personal aqua lounge — a private floating table with four chairs and sun shields that bob up and down serenely in the gentle surf just 20 feet off the beach. On hand is your very own aqua butler who will keep you comfortable in food and drink as s/he swims everything out to you. Start with the coconut shrimp with tangy mango chutney before moving on to the classic caesar with fresh romaine hearts, focaccia croutons and shaved parmesan. 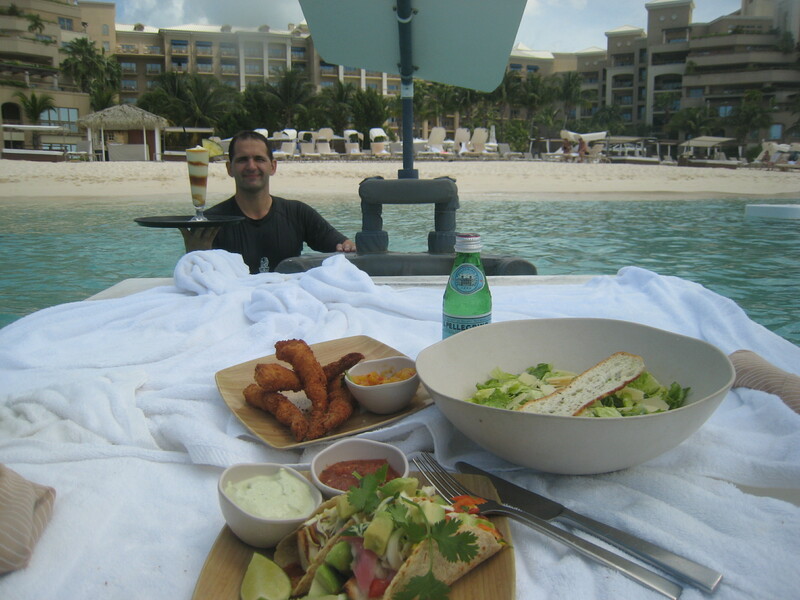 This aqua pampering isn’t complete without trying some grilled mahi tacos. The soft tacos are overstuffed with fresh mahi mahi, charro beans, tropical slaw, achiote sauce, cilantro, lime, pickled red onions and avocado. Top things off with the Ritz’s signature pina colada and you may never get out of the water or go home. Depending on how long your stay in the Caymans will determine how many of these you can cross off your list. They all have similarities, but each of the bars has a uniqueness that sets it apart from the next. This little tiki/beach bar crawl I’ve laid out for you will definitely give you the top-to-bottom, local-to-tourist tropical experience that can only be achieved on Grand Cayman Island.